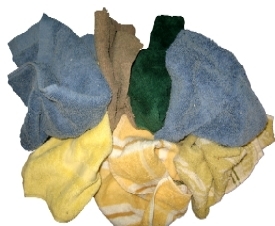 DESCRIPTION: Colored remnants, pieces of cut up terry towels/bathrobes. Water absorbent. Good for janitorial. Some uses: air conditioning, fire protection, duct cleaning and janitorial.